Wilder Harding is a bloodhound, created by the Guild to hunt down and kill vampires on America’s frontier. His enhanced abilities come with a high price: on the full moon, he becomes capable of savagery beyond telling, while the new moon brings a sexual hunger that borders on madness. Rescuing a weapons inventor from undead kidnappers is just another assignment, though one with an added complication–keeping his hands off the man’s pretty young apprentice, who insists on tagging along. At odds with polite society, Satira’s only constant has been the aging weapons inventor who treats her like a daughter. She isn’t going to trust Wilder with Nathaniel’s life, not when the Guild might decide the old man isn’t worth saving. Besides, if there’s one thing she’s learned, it’s that brains are more important than brawn. As the search stretches far longer than Wilder planned, he finds himself fighting against time. If Satira is still at his side when the new moon comes, nothing will stop him from claiming her. Worse, she seems all too willing. If their passion unlocks the beast inside, no one will be safe. Not even the man they’re fighting to save. Has: I have to say, when I first heard that this would be a steampunk story set in the Wild West, I have to admit I was very interested. 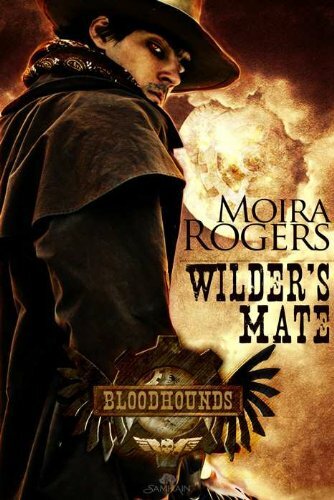 Especially when I heard that Wilder was one of Moira Rogers’ their intense heroes they have written to date. I love this combination of Steampunk and Western because it really gels well and the world-building with the added paranormal elements of vampires and shifters. Has: I know! The Wild West element also reflected the primal and intense aspects of Wilder’s species and I loved how that was conveyed. I especially loved how that factor affected the romance and relationship with Satira. It made it believable and intense. MinnChica: Yes! I think that one of Rogers’ strongest abilities is world building. And the new world they have created here between vampires and bloodhounds, and the history between the two is so inventive and neat. I always know with Bree & Donna I’m in for a great exciting story, and Wilder’s Mate didn’t disappoint!! And speaking of Satira, the chemistry and dialogue between her and Wilder was smokin’ up the pages left and right… HOT, HOT, HOT! Has: I think it is rare to get that intensity and for a short book, the sexual tension was fantastic! I know I mentioned to you before, that you need to sit in an igloo to read this book, because I could feel the smokin’ hot tension from my ereader. I am surprised it didn’t combust there and then. And I am not talking about the love scenes because they were fantastic but the buildup and how Satira and Wilder interacted during that buildup was just as good. MinnChica: Exactly! That chemistry and sexual tension was there and bubbling from the moment the two laid eyes on each other. I loved the quiet intensity of Wilder, and the brave stubborness of Satira. They were such a great couple. Has: I think this is why Wilder was such a joy to read because he was definitely an alpha and a very intense one at that who isn’t apolegetic about being what he is and going after what he wants. But he never appeared brutish or an alphahole in anyway and I adored that because I loves me some alpha heroes! MinnChica: I do too! I always say the more caveman the better, and Wilder definitely had some caveman tendencies! I also liked all the secondary characters. Hunter, Nathaniel…. they were all fabulous! Has: No question for me that Wilder was my favourite character! Although I liked Satira’s character, I did initially find her hesitant at the beginning of the story but she soon got out of shell. She was definitely a capable heroine and I loved how she helped and outsmarted the big bad in the end. MinnChica: I love that Satira was able to come up with a way to get them out of trouble at the end. I always love when brains sometimes wins over brawns. It was great! Has: I also loved the supporting characters and I really hope we will see more especially Hunter and Archer, Wilder’s fellow Bloodhounds. So many plot threads have opened up and I am eagerly looking forward to seeing the repercussions from the events in this book, Wilder’s Mate was a great start to the series. MinnChica: Yea, I can’t wait to see if the story progresses any with Hunter and Archer. They were definite plot twists that I was excited about as the story kept on going. I hope we get some more back info about how the Bloodhounds are created. That would be fabulous! Has: I think this was my only gripe about the story. I wished there was more explained about who was the Bloodhounds and more about their guild. We only got the bare bones of what they were. I actually wished the book was full length because I think the world-building was so rich and refreshing and I felt that we just had a taster when I know there is a full meal coming ahead. MinnChica: I completely agree. I wish this would have been stretched into a full length novel as well. Although I love that they were able to pack so much info into this short novella, it felt like so much more could have been thrown in, so much more back story, history and explanation of the conflicts, world building and characters. But I think that might actually be my only gripe with the story as a whole. Has: Yes! I really enjoyed it but I really do think that this would have been an even better book if things was fleshed out more. The Steampunk tech, the Wild West setting and the paranormal elements was a great combination and I was engrossed with the story and the characters but I did find that myself wishing that there was more and I think that is a good sign on how well drawn this story was set in. MinnChica: All in all, I was really impressed and happy with Wilder’s Mate. I loved the characters, and the new and complicated world building. I just wished we would have been given much much more. Has: I agree! I really enjoyed Wilder’s Mate, I especially loved Wilder and although I wished it was more fleshed out and longer because I loved the setting and the characters and I wanted more! But Wilder’s Mate was a fast pace, engrossing mighty fine read! For a new series it has made a real impression on me and I eagerly await the next book. I also give it a B! Note: Seriously I wasn’t joking about the igloo thing – I think you need one when you read the book!